For the past several weeks, The Four Black Bulls of the Spanish Weather Apocalypse have been raging through the vineyards of Northern Spain wreaking havoc. Their names are Helada (Frost), Lluvia (Torrential Rain), Pedrisco (Hail), and Viento (Wind) have caused dim prospects for the 2017 wine grape harvest in areas such as La Rioja Alta, La Rioja Alavesa, Ribera del Duero, Bierzo, Ribeiro, Valdeorras, Ribeira Sacra and Monterrei and some losses in the Albariño vineyards of Rías Baixas. 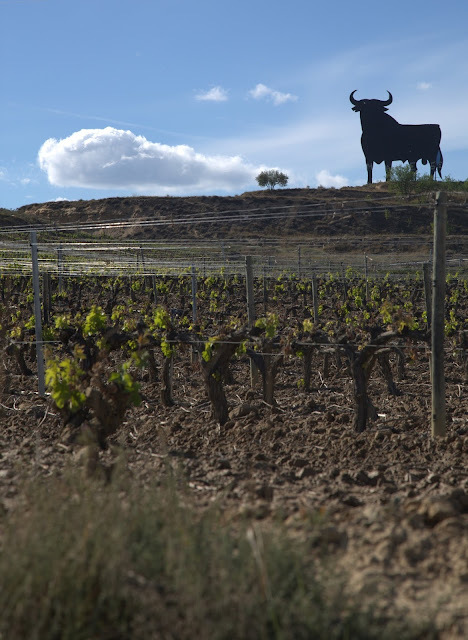 The Black Bull of Spain looms over one of Luís Alberto Lecea´s frost-damaged vineyards around the Rioja Alta village of San Asensio, May 7, 2017. The leaves on the vines nine days later are secondary growth that will produce little and are, under normal conditions, usually stripped off the vines by the grape farmers. All photo by Gerry Dawes©2017. And in their wake, they have brought a great wave of demoralization, one which the brave men and women who farm the vineyards of Atlantic Spain will no doubt overcome. Still, at this point, many predict crop losses of from 70-90 percent. 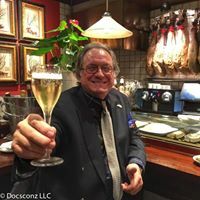 In mid-April, high winds in Galicia ripped off branches off vines in Rías Baixas according to Manolo Dovalo, owner of Adegas Rozas, who produces one of Galicia’s greatest artisan Albariños. Luis took me on a tour of his devastated vineyards. Lecea and his crew laboriously laid water lines into his vineyards and spent 800 Euros on gasoil (diesel) to run the pumps, trying to irrigate the vines, which had also been suffering from drought, hoping that the water would provoke the growth of more leaves to replace those shriveled by the frost. 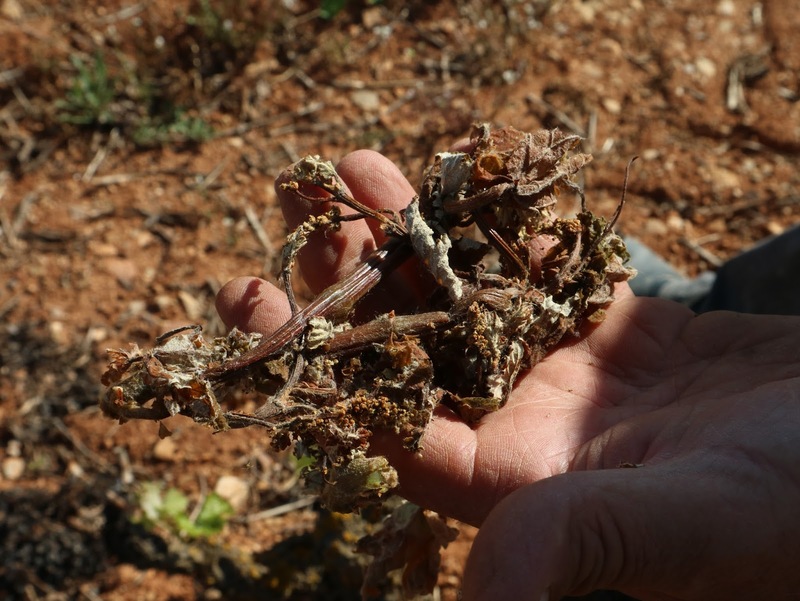 The irony of Lecea´s frost-damaged vines, with no leaves left, surrounded by the dried-up remains of once perfectly healthy ripe grapes (the now dried-up dark bunches on the ground) that had to be cut off and left to dry up on the ground to meet the Rioja D.O. yield require- ments during the 2016 harvest. Had the producers been able to use these perfectly good grapes to lay in more stocks, they would have been compensated for the big losses they will suffer from this frost in 2017 and maybe beyond. 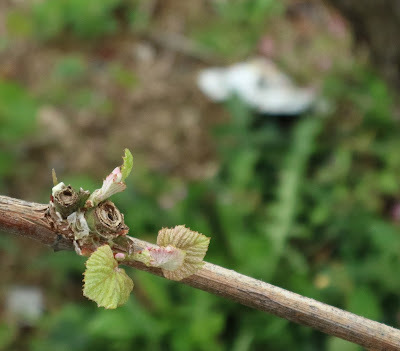 The new grape leaves are secondary shoots that will produce little or no grapes and are under normal conditions are usually stripped off the vine. All photos by Gerry Dawes©2017. 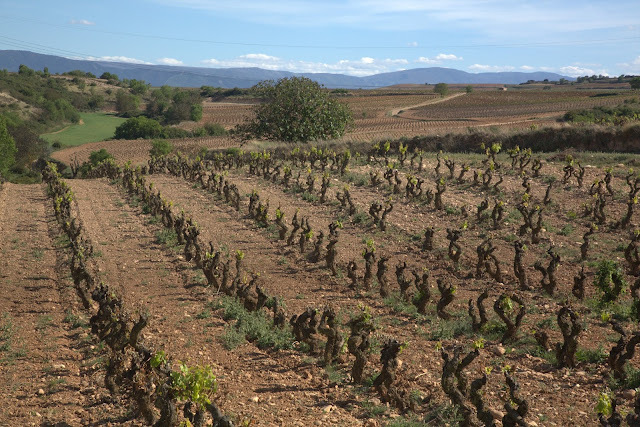 Rows of vines belonging to Bodegas Lecea in San Asensio where leaves should be beginning to flourish by May 7, 2017, when this picture was taken, are almost bare, their leaves frozen and withered by the cold wave on the night of August 28, 2017. 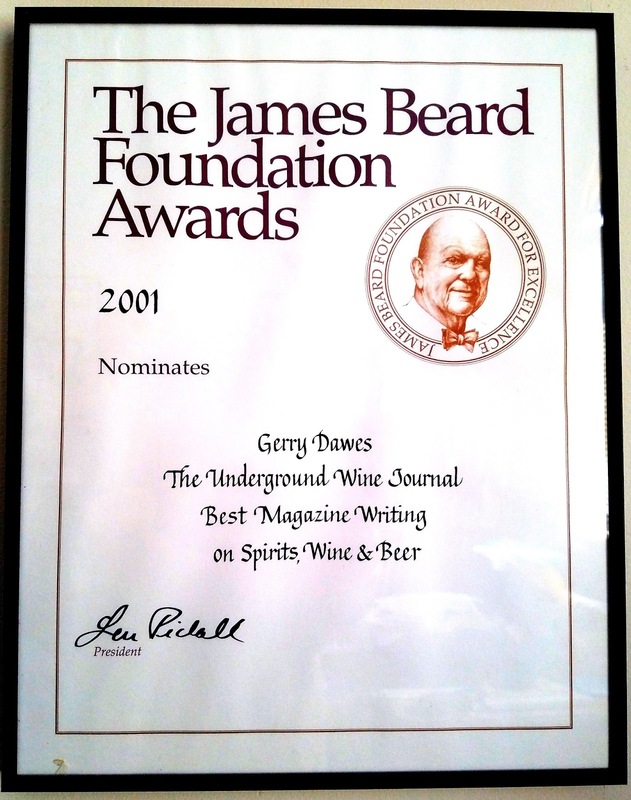 All photos by Gerry Dawes©2017. Three days later, I arrived in Villafranca del Bierzo and found roads still being cleared from mud slides, the Camino de Santiago in front of La Puerta del Perdón strewn with rocks washed down by the torrential rains, and mud across many roads, plus reports of hail and frost that, especially in lower lying vineyards, will mean a very short crop in 2017. Vine trunk burst caused by late April frost. Photo courtesy Gregory Pérez, Bodegas y Viñedos Mengoba, Bierzo. Ironically, where I saw the mud slides and rocks strewn across the road near La Puerta del Perdón in Villafranca del Bierzo was a wall mural of a hiker with the words AVE FENIX alongside. 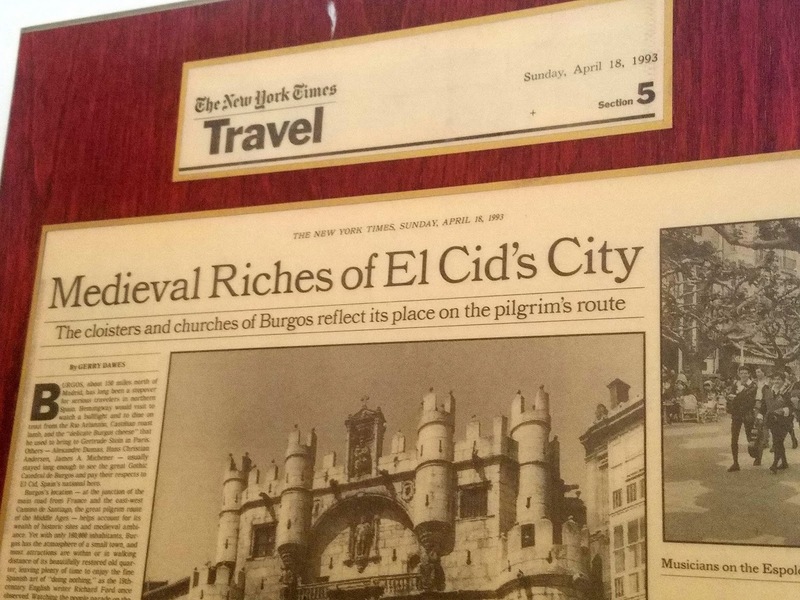 It appears that the vineyards of much of northern Spain will have to do just that, rise like the Phoenix from the ruins of the 2017 frost, regroup and battle their way back what is sure to be a very hard economic blow to their winemaking efforts. 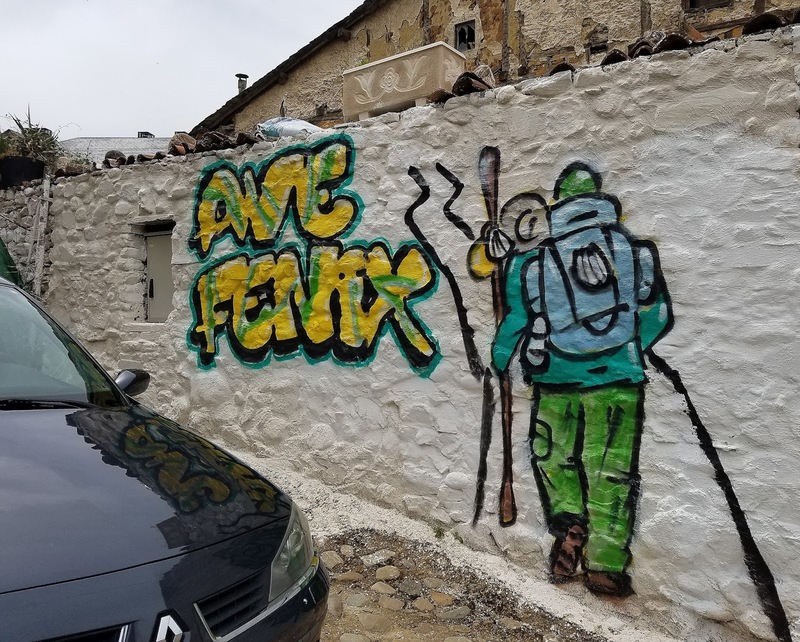 AVE FENIX: Mural on a wall just beyond the famous La Puerta del Perdón in Villafranca del Bierzo on the Camino de Santiago. 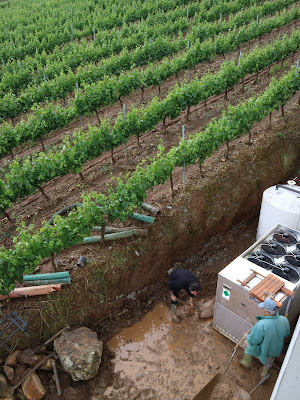 One hope that Spain´s grape farmer - winemakers will rise like the Phoenix from the devastation of the weather this Spring. All photos by Gerry Dawes©2017. Later the same day, I visited Hacienda Ucediños in O Barco de Valdeorras, whose owners Eladio and Marcos Santalla Freile reported that one of their prime Godello Vineyards was hard hit by the frost and will produce little or no wine and they were also hit by torrential rains, but even at that they were luckier than many. Eladio Santalla Freile and Marcos Santalla Freile with a bottle of their truly stunning Hacienda Ucediños Valdeorras Godello 2016, which was a great match for a dozen remarkably good zamburiñas, or baby scallops, a cazuela or two of gambas al ajillo and a wooden plate of exceptional pulpo a feira, steamed octopus dressed with olive oil, Spanish pimentón (paprika) and sea salt. At Pulperia El Dorado in O Barco de Valdeorras, May 10, 2017. At D’Berna in Córgomo in Valdeorras, higher up than some of their neighbors, escaped the frost, but were hit with mudslides during a downpour in which three inches of rain fell in just a couple of hours and brought tons of topsoil down from the vineyards that surround the winery and deposited several feet of mud and rocks in the parking lot at the side of the winery, buried their cooling unit and knocked out their water. 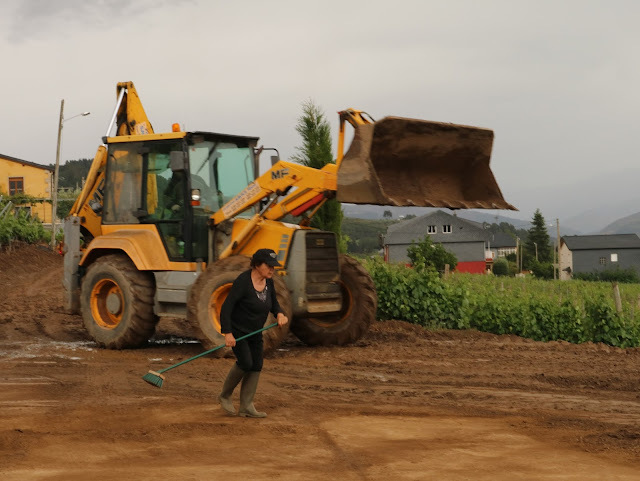 When I arrived at D'Berna, several members of the family were hand shoveling the mud into wheel barrows and taking it away, while a front loader Caterpillar plowed mud out of the parking lot and road leading into the winery. And, in Ribeira Sacra, where I was last week, more reports of hail and torrential rains. 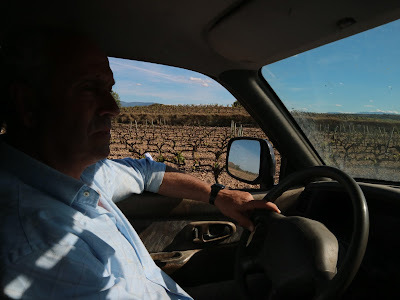 José Manuel Rodríguez, President of the Ribeira Sacra D. O. and producer of the superb Décima Mencía, suffered damage to one of his prime vineyards to add to the loss of much of his crop last year to a powerful hail storm. Here there were also reports of frost and more damage from hail and torrential rains. Undamaged vineyards of Manuel Rodríguez, President of the Ribeira Sacra D. O. and producer of the superb Décima Mencía, who lost much of his crop to a severe hailstorm last year. 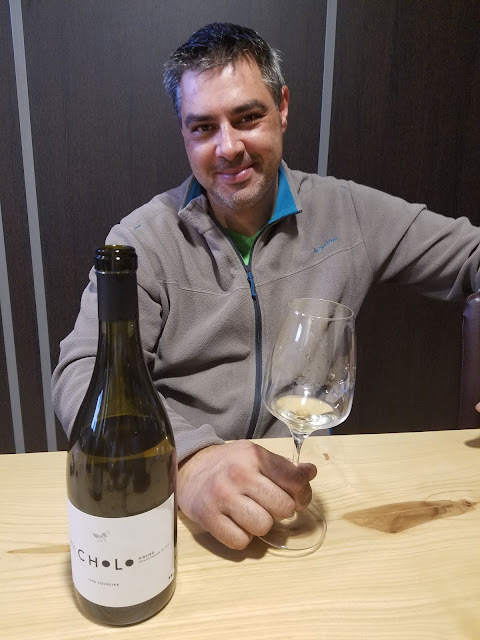 In mid-April, high winds in Galicia ripped off branches of vines in Rías Baixas according to Manolo Dovalo, owner of Adegas Rozas, who produces one of Galicia’s greatest artisan Albariños. 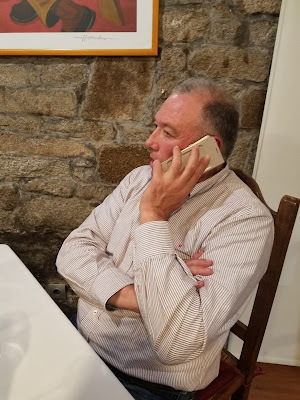 I spent an afternoon with my Bodegas Artesanas Albariño producers in Rías Baixas, where though Dovalo of Adegas Rozas reported some wind damage in his vineyards, all six of my producers seemed to have escaped serious crop-crippling damage. Manolo Dovalo, producer of Rozas (third from left), with the Bodegas Artesanas Albariño producers' wines, which are some of the greatest Grand Cru quality white wines produced in Galicia. Not so in Ribeiro, to the east and inland, where Manolo Formigo (pictured above) showed me frost damage and estimated that he may lose as much as 80% of 2017’s expected production. 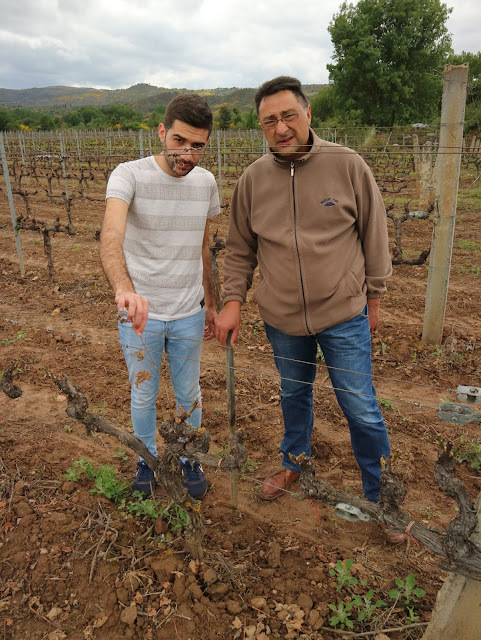 In Monterrei, one of the last regions I visited Antonio Triay, his wife Puri García and their son Ivan showed me their frost-damaged vines and were very demoralized. They are small very high quality producers of Triay Godello and Mencía and they believe that 85-90% of their 2017 crop was wiped out in the late April frost that hit the Monterrei D.O. particularly hard. 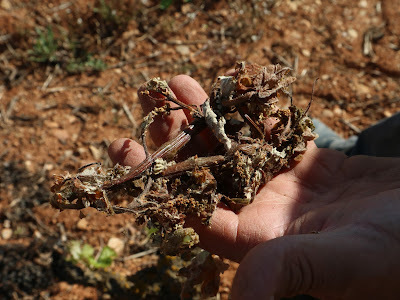 Antonio Triay and his son Ivan showed me their frost-damaged vines and were very demoralized. All photos by Gerry Dawes©2017. 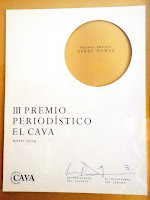 Of all the regions I have visited so far, Viña Catajarros in Cigales and José Pariente in Rueda reported to me when I visited those area that they suffered little or no damage and, early in my trip, southern Navarra seems to have escaped damage. 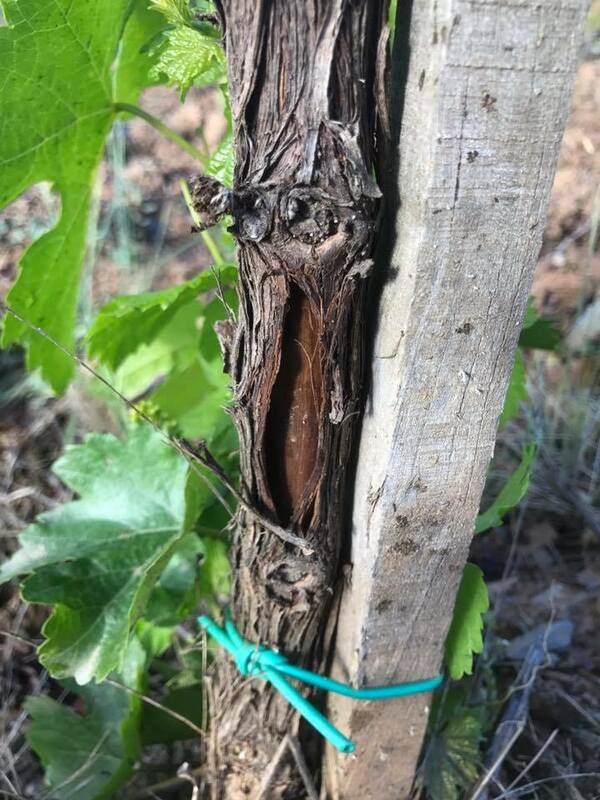 In Corella (Navarra) Carlos Aliaga at Bodega Aliaga reported no damage. Ironically, the wall mural of a hiker with the words AVE FENIX was a harbinger. 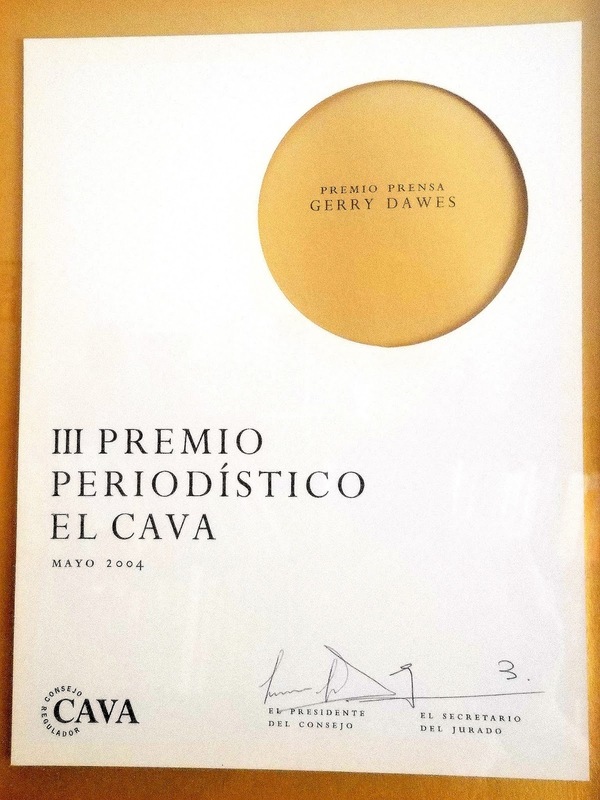 It appears that the vineyards of much of northern Spain will have to do just that, rise like the Phoenix from the ruins of the 2017 frost, regroup and battle their way back what is sure to be a very hard economic blow to their winemaking efforts. 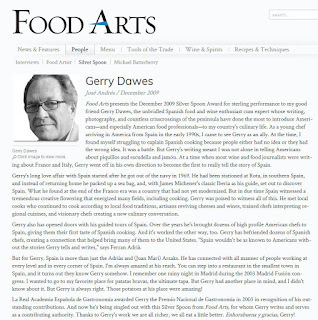 If you enjoy these blog posts, please consider a contribution to help me continue the work of gathering all this great information and these photographs for Gerry Dawes's Insider's Guide to Spanish Food, Wine, Culture and Travel. Contributions of $5 and up will be greatly appreciated. 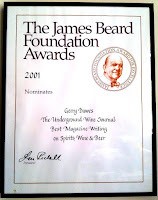 Contributions of $500 or more will be acknowledged on the blog. Please click on this secure link to Paypal to make your contribution. 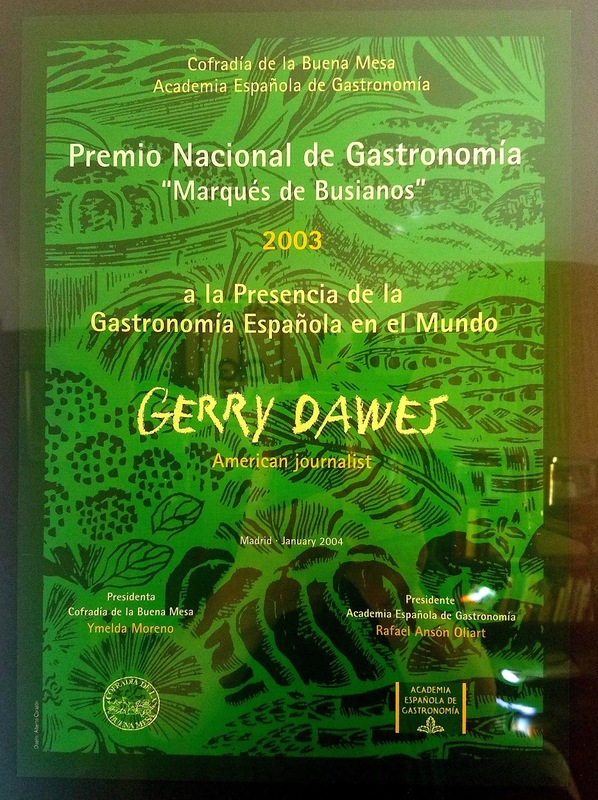 D’Berto specializes in simply prepared but sensational crustaceans, mollusks and fish from the beautiful Rías Baixas (lower fjords) of the northwestern region of Galicia: cigalas (Dublin Bay prawns), langostas (spiny, clawless lobsters), camarones (small, succulent shrimp), vieiras (scallops with their orange coral) and centollos (big spider crabs). 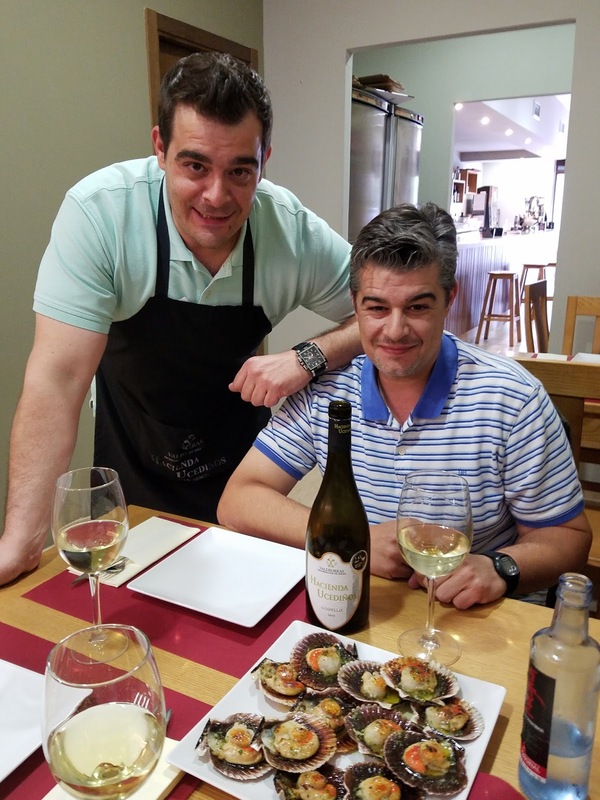 Owner Alberto “Berto” Domínguez’s pristine selections are matched by his chef-sister Marisol’s spot-on cooking techniques, and the wine list features stellar picks, like Albariño Do Ferreiro “Cepas Vellas,” one of Spain’s best whites. Dinner, $70. 84 Avenida Teniente Domínguez, O Grove, Pontevedra, Galicia; 34-986/733-447. Where to Stay: Located roughly ten miles south of O Grove, the Gran Talaso Hotel Sanxenxo (rooms, from $175; 3 Paseo Praia de Silgar; 34-986/691-111) overlooks the Ría de Pontevedra. Nearby, two other options are the classic beachfront Gran Hotel La Toja (rooms, from $300; 34-986/730-025) and the Parador Nacional de Cambados (rooms, from $200; Plaza Calzada; 34-902/547-979), set in a 17th-century mansion.